The Embraer aircraft had departed Cincinnati at 14:53 for a flight to Detroit. Thirty-eight seconds before impact the aircraft was flying at 4000 feet with a speed of 164 knots, flaps and gear retracted and engines at flight idle. After making a turn to a 090deg. heading, the Brasilia then started a slight roll to the left. When the angle was about 20deg. left wing down, the crew tried to counteract the roll (t-33 sec). The bank angle increased through 30deg. at t-29 sec, followed by an increase in engine power when the crew tried to stop the pitch from decreasing at t-26 sec. At t-17 sec airspeed had dropped to 145 knots when a rapid roll from 40deg. to 146deg. left bank was experienced. At t-10 sec the pitch decreased from 3deg. nose-up to 50deg. nose-down. The aircraft descended out of control, experiencing some steep roll and pitch oscillations and crashed nose down into a snowy field 18 miles short of the Detroit-Metropolitan Airport runway 03. There were indications that the pilots had tried to activate the engine-fire extinguishing system, though no traces of fire on the no. 2 engine have been found by the NTSB. PROBABLE CAUSE: The National Transportation Safety Board determines that the probable cause of this accident was the FAA's failure to establish adequate aircraft certification standards for flight in icing conditions, the FAA's failure to ensure that an FAA/CTA-approved procedure for the accident airplane's deice system operation was implemented by U.S.-based air carriers, and the FAA's failure to require the establishment of adequate minimum airspeeds for icing conditions, which led to the loss of control when the airplane accumulated a thin, rough accretion of ice on its lifting surfaces. 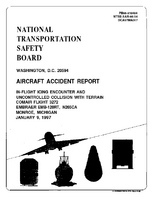 Contributing to the accident were the flight crew's decision to operate in icing conditions near the lower margin of the operating airspeed envelope (with flaps retracted), and Comair's failure to establish and adequately disseminate unambiguous minimum airspeed values for flap configurations and for flight in icing conditions." Distance from Cincinnati/Northern Kentucky Airport, KY to Detroit-Metropolitan Wayne County Airport, MI as the crow flies is 367 km (229 miles).